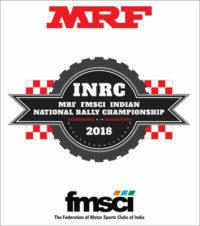 The MRF FMSCI Indian National Rally Championship (INRC) is the premier rallying series in India run under the aegis of the Federation of Motor Sports Clubs of India (FMSCI), which is the Governing Body or ASN of India recognized by the FIA, culminating with the Indian National Rally Champion Driver, Co-Driver and Team. The championship is based on a point system. The championship first received its National Championship title status in 1988. Indian drivers in Indian cars are eligible to take part in the 2016 INRC. Ramakrishna Race Performance Management Pvt. Ltd.
INRC Upto 3500 cc (including Turbo Factor) FMSCI R2 Kits, FIA R2 Kits Compete for INRC. INRC 2 Upto 2000 cc FMSCI Rally Sport Regulations Compete for INRC 2 & INRC. FMSCI 2WD Cup Only for Honda City VTEC, Maruti Esteem and Maruti Baleno homologated prior to 31st December 2007. Compete for FMSCI 2WD Cup and not classified in the INRC Classification. The fastest among INRC / INRC 2 / INRC 3 driver will be declared winner of the rally.